Pressed flowers professionally framed. We grow and press all of our own flowers, mounting them on handmade papers from local artisans. At Petal Annie, we do not mass produce our pictures, but strive to create one of a kind pieces. This is truly a gift from nature. Annie's been as busy as a little bee creating her beautiful garden scenes. 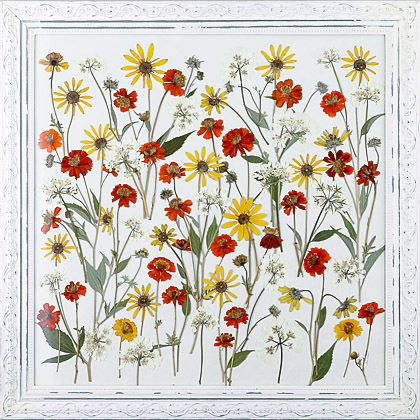 Come see us soon - and often, we always present a new selection of pressed flower art at each show! Petal Annie is now selling the following on www.etsy.com. Petal Annie is in the news at: www.Chicago Tribune.com. Petal Annie's Blog can be seen at: www.petalannie.blogspot.com. Special thanks to Constellation Web Design for their help creating their signature "clutter-free" web site for 'Petal Annie'. Our customers love it! Contact jack@constellationweb.com for help with a website for your business today. Announcement: Petal Annie is now selling her pressed flower art on www.etsy.com.